The All Americans in World War II: A Photographic History of the 82nd Airborne Division at War by Phil Nordyke - Jimmie Aaron Kepler, Ed.D. 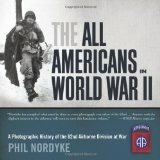 “The All Americans in World War II: a Photographic History of the 82nd Airborne Division at War” by Phil Nordyke delivers what the book’s title promises, a photographic history of the 82nd Airborne Division at war. The book is filled with numerous black and white photographs. The photographs are excellent and many that have never before been published. The book is organized into 36 chapters. The chapters chronicle the 82nd Airborne Division’s from the division’s reactivation in February 1942 to the return to the USA in January 1946. The chapters begin with a one-page summary of that stage of the 82nd’s action. A skillfully produced map showing the locations of allied follows the chapter summary. It contains locations of allied and axis units visually showing their actions that are covered in the chapter. Next, the reader feasts with pages of period photographs of the action. There are 30 detailed maps and 365 photographs. This book is a very useful addition to or a great stand-alone volume for the reader wanting to learn more about the All American Division in World War II. It really is spectacular. It would be an excellent addition to any military historian’s library of college and community library. I am a former US Army officer who graduated from airborne school in class 36-76. I found myself reading the book in one sitting. My father is a World War II veteran who served in the European Theater of Operations. He also could not put the book down until he had read it from cover to cover.